100% Legal in USA, Canada & UK. 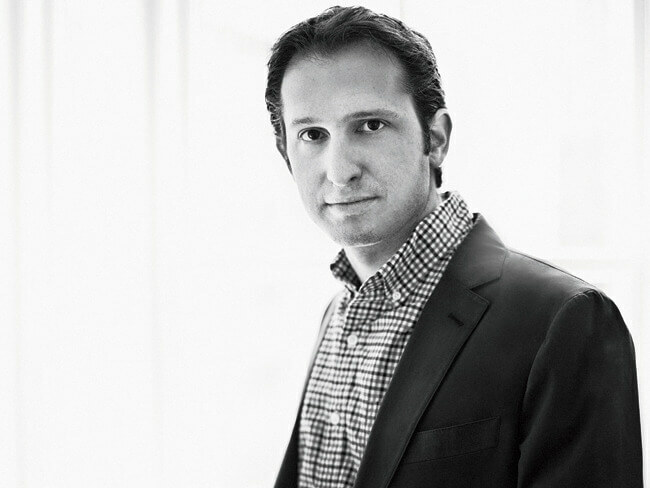 DraftKings was established in 2012 by Matthew Kalish, Paul Liberman, and Jason Robins, former VistaPrint executives. They started operating out of Paul Liberman’s house and they started with launching a baseball competition in 2012. Only a few months after that, they received their first outside funding from different investors. Since its 2012 launch, the site has guaranteed 2 billion dollars in prizes, with over 1 billion being awarded to players in 2016. With the easy to use software, huge guaranteed prize pools and great promotions, they have great customer retention. More details and information about DraftKings, their offered markets, promotions and much more, you can find in the following DraftKings Review. 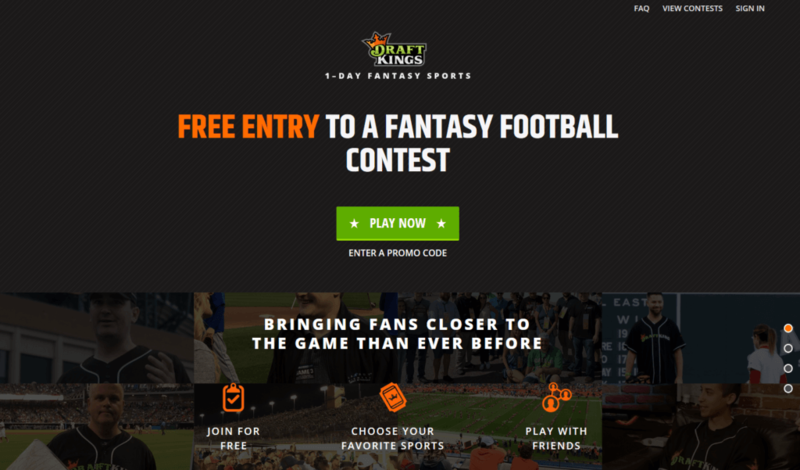 DraftKings is offering a great promotion to all their new UK customers. 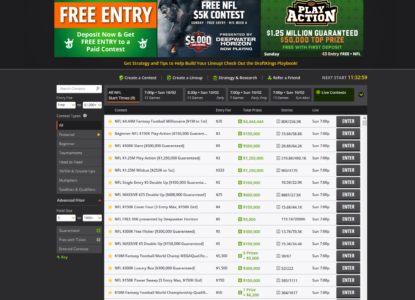 You can now enjoy a free $3 tournament entry to try out any eligible Daily Fantasy Sports games on DraftKings. So make sure to not miss you free shot at your first event and enjoy the DFS experience without investing your own cash. Our following step-by-step guide will show you how to easily set up your account within a few minutes and enjoy a free $3 Tournament Entry. Please make sure to use our signup link to start the free registration process. You will now be redirected to their homepage, where you just need to click the ‘SIGN ME UP’ button in the middle. On the following screen you need to add your personal details like your country of residence, address, phone number, currency etc. Once your account is created you can start to deposit your first money into your new account. 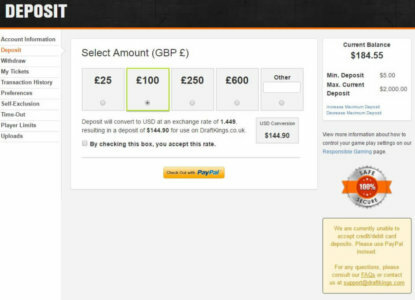 Simply choose your preferred payment method and follow the instructions on the screen to finish the deposit process. 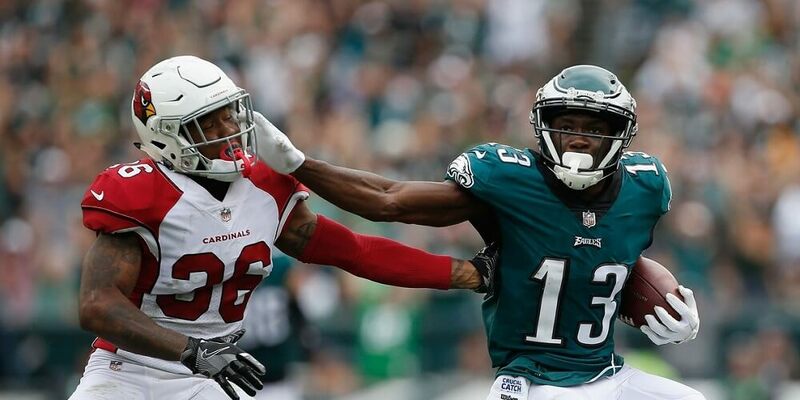 DraftKings provides the widest array of daily fantasy games which include: NFL, MLB, NBA, NHL and PGA, MLS, NASCAR, MMA, Premiere League and eSports. DraftKings also has multiple game types to choose from. Cash Games consist of Head to Head and 50/50s. You can always find a game on DraftKings ranging from $.25-$1,000+. This is where the real money is to be made on DraftKings. With Prizes rising into the millions for first place, you are sure that day in and day out there are big guarantees that offer massive prizes for first. 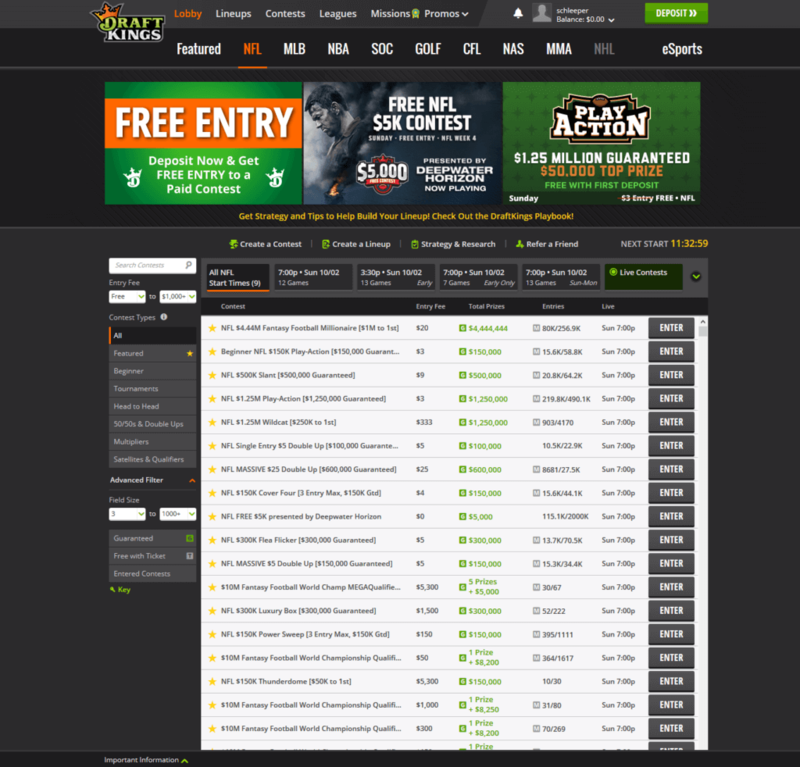 Buy ins range from $.25-$1,000+ and the contests get from a few hundred to hundreds of thousands of entries. 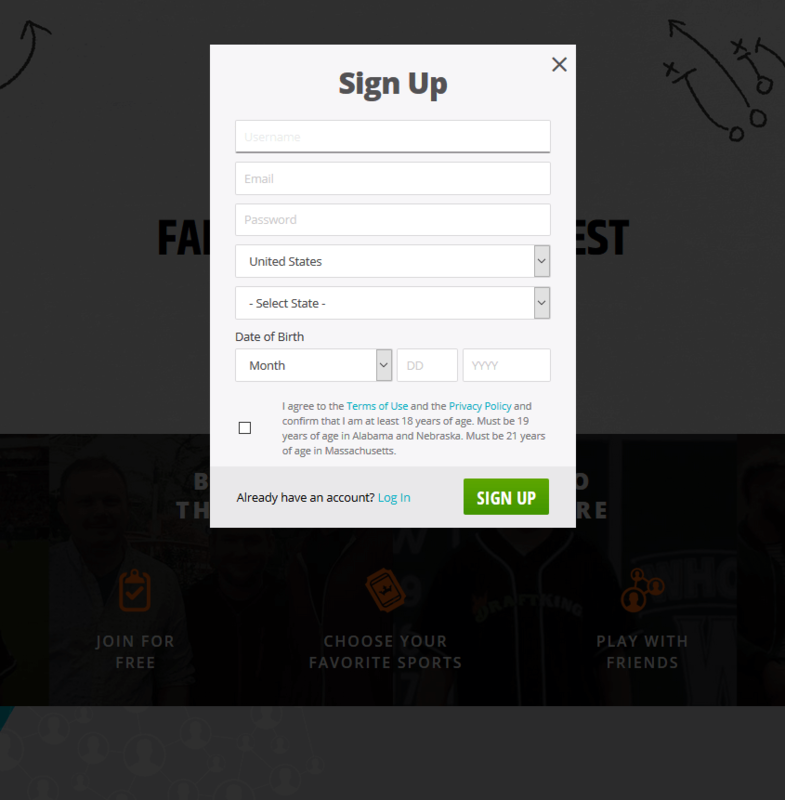 The DraftKings software allows you to easily choose and join your contests. On the lobby page you can see all Sports types at the top as well as all featured tournaments that start soon or in the upcoming month. With the available filter options you can easily find games that suit you. After clicking “enter” in the lobby you are brought to your lineup creation page. Here is where you draft a team that is used in the contests you join. With the multi-entry features you are able to join multiple contests with multiple lineups. 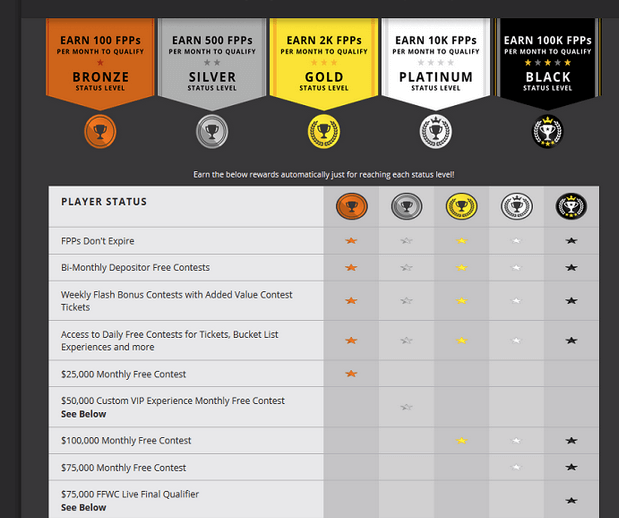 DraftKings offers a unique Reward System that rewards yo by simply participating in Games or Tournaments. Through earning FPPs, you also increase your VIP Status. 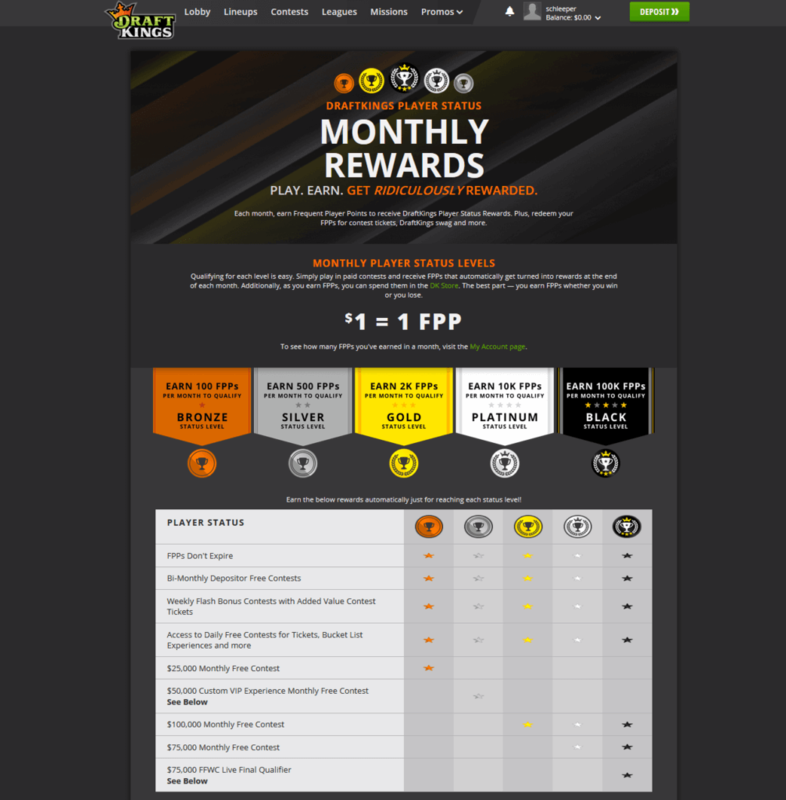 Frequent player points (FPP)- Start unlocking access to rewards every time you play. Get entry to exclusive free contests to win cash prizes and VIP experiences. Plus, choose from contest tickets, apparel and merchandise in their Store. 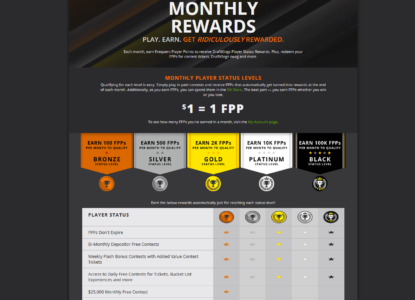 Start taking advantage of all Player Rewards now! Reach a Higher VIP Status for even more Promotions! Become Bronze, Silver, Gold, Platinum or Black VIP Status and enter Monthly Free Contests and take part in extra Promotions. Stay active to keep your VIP Status and Benefits. Chase the Black Status VIP Level to be an elite player. Flash Bonus Blitz are Surprise contests with added Tickets and Cash. They are running every single day! You can find these contests in the Lobby with a Blitz Icon! There are two different options available to deposit to your DraftKings account. They accept all major credit cards and PayPal payments. Check the following table to some more details about all accepted payment methods. Please note, any withdrawal requests, after approved, will be credited back to the same credit card or method of payment used to deposit funds dating back 90 days in chronological order. 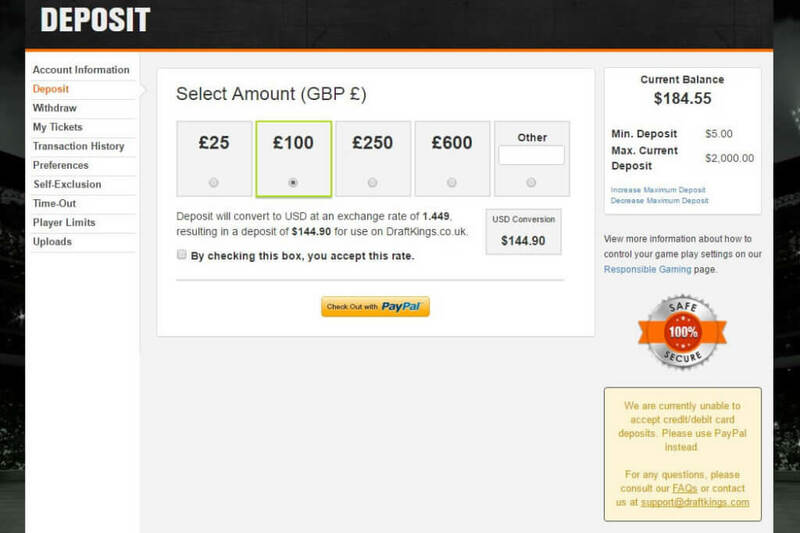 Once all deposits in the past 90 days have been refunded, they will send any remaining funds via PayPal or check. 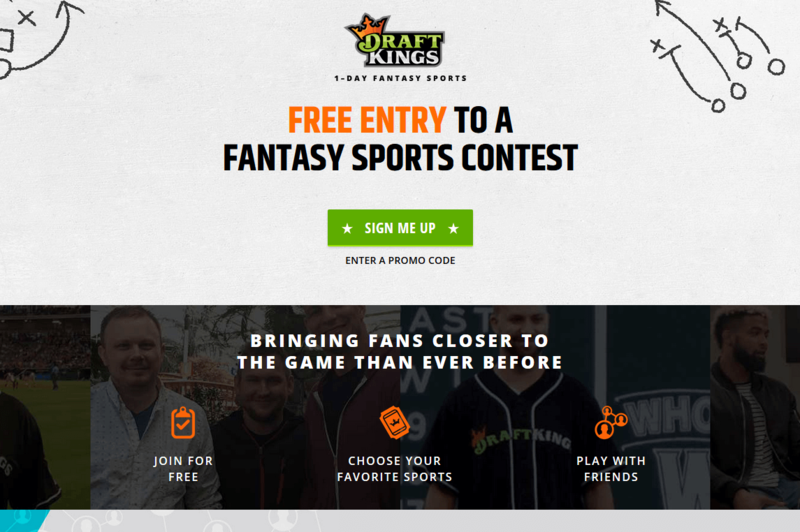 Like their competitor FanDuel, DraftKings also offers a lot of ongoing and great promotions to their customers. We have summarized all current running promotions for you and you should make sure to regularly check our overview to not miss anything. DraftKings Promotions for UK customers – New DraftKings customers from the United Kingdom can now take advantage of four free entries when they deposit at least £5 into their account. These entries can be used to enter any contest from the lobby. 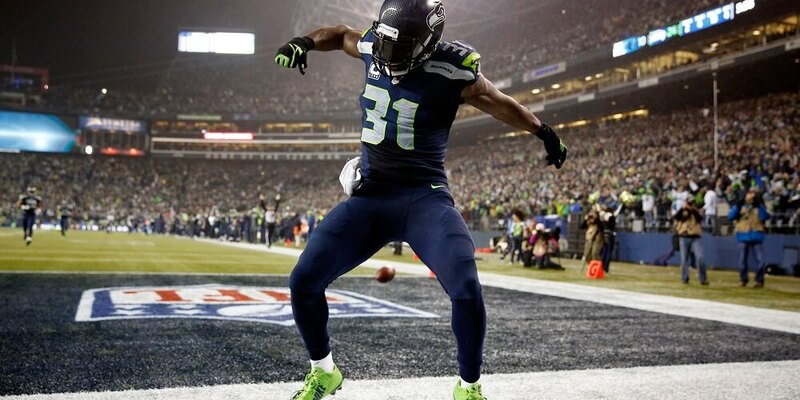 DraftKings is one of the largest Daily Fantasy providers. This skill-based DFS platform providers customers from North America and the United Kingdom to compete in many exciting competitions. The company offers a large selection of professional sports in their contests, with a focus on US sports. However, since the interest in DFS is growing steadily there are plans to add more European markets as well. 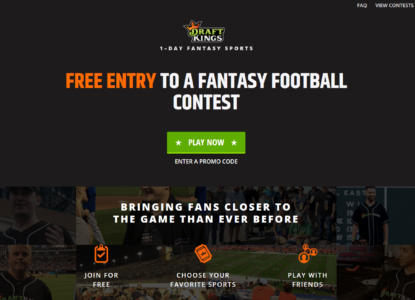 In April 2013, the Major League Baseball invested an undisclosed amount of money in DraftKings, becoming the first professional sport organisation that invested in daily fantasy sports. November 2013 was another big month for DraftKings. The company received another funding from investors such as Accomplice, Redpoint Ventures, BDS Venture Fund, Jordan Mendell, and GGV Capital. $24 million were invested and helped them to keep its rapid growth. 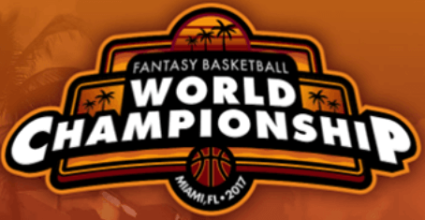 They had already awarded $50 million in prizes in 2013 to players in daily fantasy baseball, weekly fantasy football, daily fantasy hockey and daily fantasy basketball. 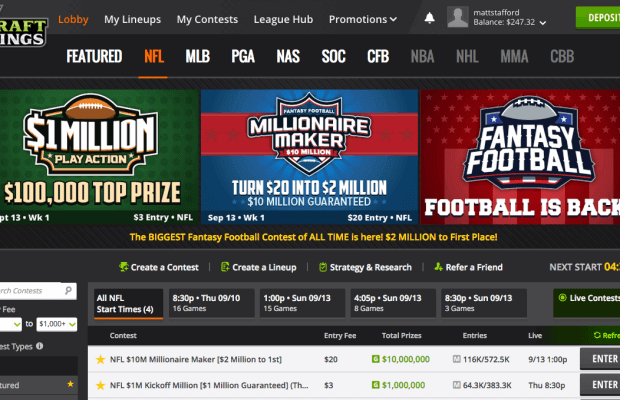 DraftKings also reported 50,000 active daily players and 1,000,000 registered players. In mid-2014, they became the 2nd largest company in the daily fantasy sports market, announcing the acquisition of the 3rd largest company, their rival DraftStreet. This was another big step and increased their customer base by roughly 50%. In August 2014 the company received a $41 million funding from investors such as The Raine Group, as well as from existing investors GGV Capital and Redpoint Ventures. Another key move was the multi-year agreement with the NHL in November 2014. This contract gave them the rights to use NHL’s intellectual property and helped them to keep increasing their user base. In April 2015 they signed a multi-year deal with Major League Baseball, becoming the “Official Daily Fantasy Game” for the sport. In 45 of the 50 US States skill based gaming is allowed and makes DraftKings legal in these US states. Besides the US, they also have a huge customer base in Canada. 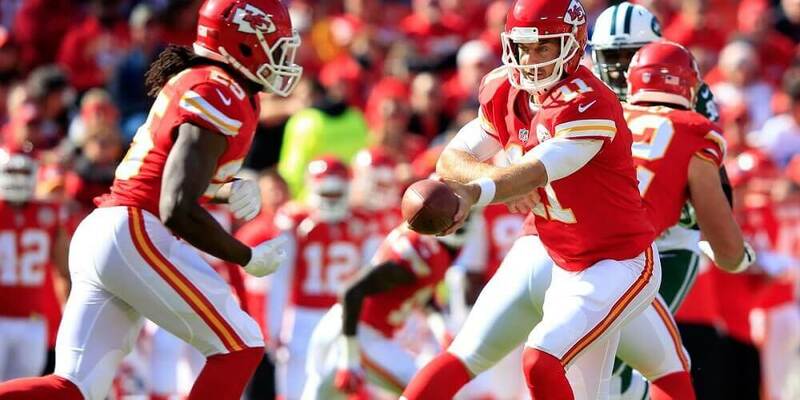 The main sports competitions featured in fantasy games are located in the US and Canada which is the reason that a huge part of Drafkings customer base is in North Americans. 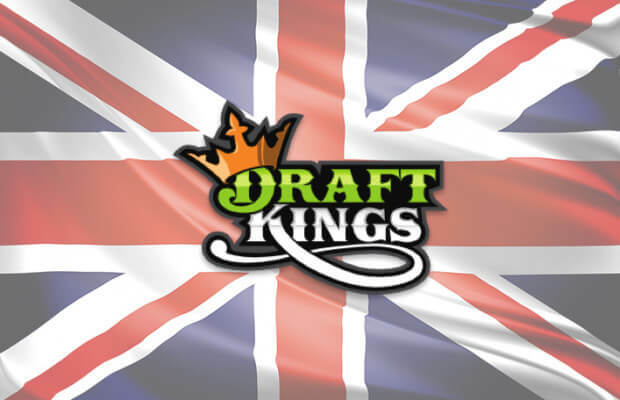 In February 2016, DraftKings entered huge markets overseas – specifically the UK. In the UK, they focuse on what the brand calls “proper soccer”, as opposed to the US variety that the Draftking’s business is built upon. The games offering are based on the UEFA Champions League and the English Premier League (EPL). They are also in talks with Arsenal and Liverpool to sign new marketing deals. In essence, DraftKings has a history of rapid growth and is reaching into more and more markets. 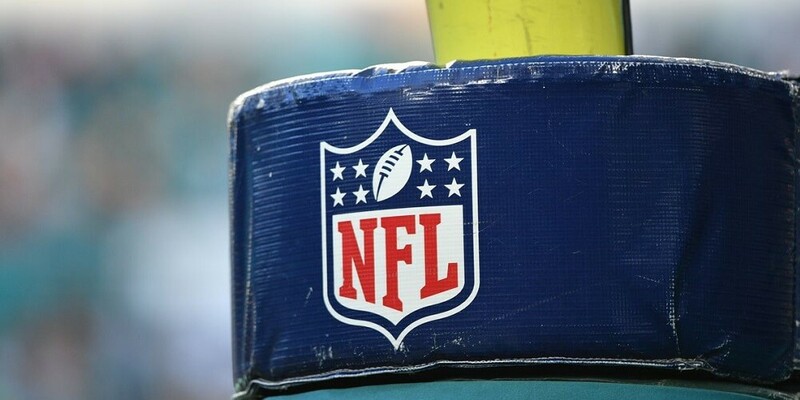 With this outlook, DraftKings is a force to be reckoned with in the Daily Fantasy Industry. In November 2016, after a turbulent year for both companies because some attorneys questioned the legality of their games in some states, DraftKings and FanDuel announced to merge into one company. The merger, of curse, has to be approved by regulators first. Most likely, the merger will not be completed before the second half of 2017. Licenses: United States, Canada, UK. DraftKings has one of the best and easy-to-handle mobile applications. You can smoothly navigate through your teams and check the ranking for each contests. You can see which sports and contests are available to play and you can also enter contests or create your own contests for you and your friends. Add funds directly to your account or check the date scoring, no matter where you are right now. Thanks to their great mobile app you will have access to the same features as the website and can enjoy the full DFS gaming experience on the run. You can use a mobile app for all your Android and iOS devices. The iOS app can be downloaded from the Apple Play Store and the Android version is available for free in the Google Play Store. Check the following links to download the app to your mobile devices. Downloading and install the iOS app to your mobile devices is easy. Just click one of the following logo and download the app to your mobile device. To download the Android app just click the following button and follow the instructions on the DraftKings Mobile website. Please note, you will also find several other sources where you can download the android app, but we would highly recommend to not use apps from an unknown source and only use the app from the original app from their homepage. Rake essentially is a commission taken by the operator from a small percentage of your contest fees. For example, when you see a buy in of $50 on DraftKings, 10% of that $50 are taken as the rake when you join the contest. 45 US states allow DFS, thus DraftKings is completely legal there. Only customers from Arizona, Iowa, Nevada, Louisiana, Montana, Mississippi, New York, Texas and Washington are not allowed to open an account. 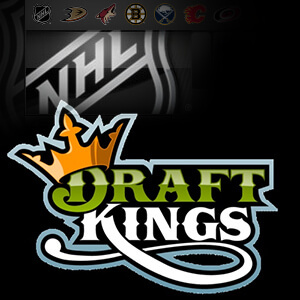 Besides America, clients from Canada and the United Kingdom are allowed to use DraftKings.